‘During a contentious school board vote led by an Orthodox Jewish majority, a prominent leader in the Hasidic community is ruthlessly kidnapped by a local right-wing extremist and witnessed by the curious eye of this teenager.’ –what if this was a headline in the Rockland County Times? While not an actual headline, the new independent film “The Hudson Tribes” hits close to home. East Ramapo School District has been the single most divisive issue among locals. Everyone has a chosen side. 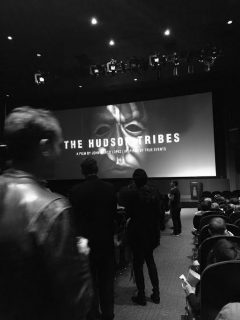 “The Hudson Tribes” is not a documentary, but a dramatic, inspired by true events- screen play about this local clash of cultures and interests. The film frames the racial and socio-economic rift that has ensued in this scandal-ridden Hudson Valley county, while building compelling subplots around everything from love to the strange alienation Rockland can drive souls to experience. The debate over kinks in the democratic process shouldn’t come as a surprise in an election season, but most folks are unaware of the little known all-American process of electing a school board. If this sounds boring, and I have lost you already, read on. I promise not to spoil the plot. I should add, even if you have been following the East Ramapo story, the script John Marco Lopez has written stands on its own. I have been covering the area since 2010 and the scoop in local politics usually hinges on dollar signs and backdoor bribes. This movie, however, is anything but a board room drama snore. Written and directed by John and produced by his brother Kevin, from the first flickering of brilliant cinematography, the thriller kept me on the edge of my seat until the moment the closing credits began to roll. Precisely what makes “The Hudson Tribes” a triumph is the direction Lopez takes to portray the interconnectedness of power in politics and the subtle ramifications of the law. In the newspapers this story can be a bit subtler, i.e. who pays the bulk of property taxes, questionable school text books, maybe a stolen bike, and yes, hate crimes, those are all real issues. In the film we not only get a look into back door politics, we get a glimpse into the homes and lives of just about every represented demographic in Rockland County. “The Hudson Tribes,” as the name implies, is set in Monsey, a hamle whose namesake is drawn from the Monsey (Munsee) Native American tribe an is an adjunct to the Spring Valley quasi-urban area. This demographics of this part of Rockland County have shifted from mostly working class African-American to Hatian American, as well as increasing numbers of Latino as well an explosion in the Ultra-Orthodox population. You get a real image of the melting pot that is Rockland in this movie. But has the census-busting growth of the insular Ultra-Orthodox caused that pot to be overcooked? Curious attempts at understanding the process of Albany public school funding, and the accountants needed to run numbers makes for bad cinema, so Mr. Lopez skipped most of the binary code, and went straight for the heart. After all, the devil is in the details. The palpable feeling of otherness, fairness, and the struggle with leadership are at the heart of the film. How does a community who self-ghettos, take public funds? And how, without stellar education, can a community of immigrants, many of them speaking English as a second language, thrive- in an out-dated school system? There is of course a scramble for resources, and money doesn’t just trickle down stream from Albany without some gravity. A polished, articulate Mayor Joubert Lafitte is the sitting mayor, but he’s more consumed with his own power. Sound familiar? The storyline of “The Hudson Tribes” often does. Lafitte struggles with allocating resources for his own people when confronted with the favors he owes to the Orthodox bloc vote. Early in the film, we see the mayor entangled romantically with a woman who is not his wife, played by Jeannine Kaspar, who is a composite of the lapsed Orthodox genre. The Haitian American mayor is played by Godfrey, who told the Rockland County Times that he’s never met the real mayor of Spring Valley. The real mayor is entertaining in his own right and Godfrey plays a great lead that is somewhat reminiscent of Mayor Delhomme. Aloof to the politics in his own community, Avi, a Hasidic teenager played by, Owen Cambpell, peers outside the invisible ghetto wall, curiously in love with a public school teacher. His admiration for her, might as well stand for everything he is taught in yeshiva to avoid. The outside world is dangerous, and the ground beneath him begins to open. The outside world is, for him only imagined, but is willing to risk it all for a dance in a Chestnut Ridge kitchen. He tells Bella, played by Vanessa Rubio, he is not the person he looks like, that he isn’t like those others. Those people. He is not one of them, but he is also does not belong in her kitchen. In his search for identity, Avi is the protagonist as he fights for justice amidst racial differences and escalating street violence. Later in the film when he discovers his love interest is, unbeknownst to her, living with the kidnapper, we see his youthful naivety. Avi is just a boy, but he could be the hero. Any child from the East Ramapo public schools or Yeshiva could be the hero, but will the tribes put their differences aside?